It doesn’t look very exciting, but this casserole is very tasty, easy to use, makes a huge quantity, and was a great way to use up lots of farm products! 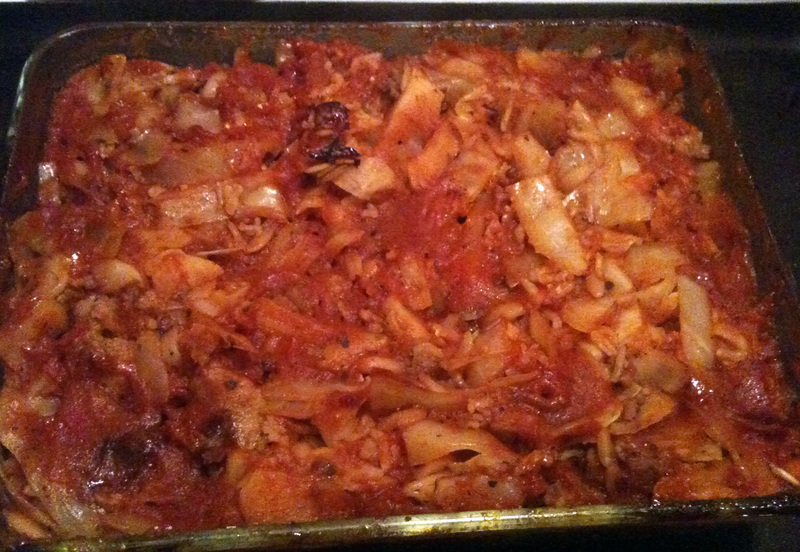 If you like cabbage rolls, it’s a much easier way to make something similar, too! • optional: 1Tbsp goat’s milk Chevre or similar cheese per serving. 1. In a large sauce pan, brown meat until it is no longer red. While it is browning, add seasonings to taste. The amounts listed are roughly what I used, but it is personal preference here. 2. In a large bowl, combine cooked meat, onion, cabbage, and rice. 3. Pour into a casserole dish or two, depending on the size of your cabbage. 4. Pour stock evenly over the dish(es). 5. Cover tightly with aluminum foil and bake for 1 hour. 6. Take out of the oven, stir, re-cover, and bake for an additional 30 minutes or until rice is cooked. Optional: after serving, add approximately 1 Tbsp of goat’s milk chevre or a similar soft cheese and stir. It will melt in the residual heat and give your dish a very similar taste and feel to lasagna.